It’s our 10th Birthday, Our 10 Year Anniversary – Can you believe it! Hamilton Pride proudly presents Pride Preview | 10 Years on | Finding our History! This Pride Preview is an introduction to pride week, who we are, where we’ve come from and where we’re going! Not only will we share our story, but you will hear from other Waikato Queer organisations about who they are, what they do and what exciting events they have coming up in Pride Week! So come along and check out What Hamilton Pride is all about, what is happening during Hamilton Pride week & meet all the contributors to the Hamilton Queer Community. On top of this, we have an amazing line up of entertainment including local Drag Talent & Singers | the event is hosted by Hamie from Flat Out Pride! And Shane from Hamilton Pride! 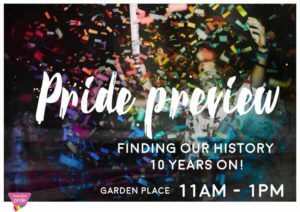 Pride Preview | 10 Years on | Finding our History | Saturday 1st September | 11am – 1pm | Garden Place | Free Entry | All Ages | Presented by Hamilton Pride | See you there!